Dawn rises and an indigo curtain of stars is drawn back from the sky, exposing a dramatic landscape of soaring peaks that sweep down across grassy lowlands to the black volcanic sand that kisses the blue of the Bali Sea. 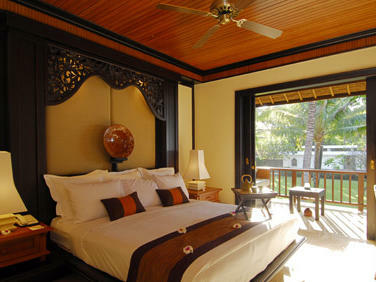 You are in Spa Village Resort Tembok, Bali, and the day has just begun. There's something special about Bali. Almost everyone who comes to the island feels it. Set against a lush landscape of mystical peaks and the vivid blue sea, this peaceful spa resort is a unique Bali escape, tucked away on the tip of the island's northeastern coast. Yet there's a subtle vibrancy that runs through this part of Bali; a barely perceptible shift in time that takes one back to the true Bali. Discover Tembok, where epic stories lurk in its history and a raw natural beauty is evident in its simple landscape. The gentle spirituality of the island and its rich culture infuses every encounter in this tranquil spa resort. Its philosophy of wellbeing extends beyond the traditional spa treatments available and encompasses every aspect of the resort from activities and lifestyle to architecture and cuisine. Effortlessly blending with the island's natural beauty, the structures of Spa Village Resort Tembok, Bali offer luxury accommodation that merges simple Western elegance with traditional Balinese dwellings. Design is kept sophisticated yet understated with natural Balinese timber accented by neutral fabrics and simple local decorative elements. Rooms are transformed into exclusive havens; suites are generous with stunning views while the villas are private sanctuaries of peace. Contemplate life on the wide terraces or balconies, take a rejuvenating plunge into the pool or explore at your personal pace. 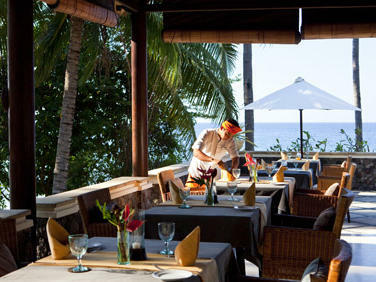 With captivating views of the Bali Sea, set above the slate-hued beach, the unique setting of the resort's only restaurant offers exciting, flavorful regional Balinese and international cuisine. Resting beneath a thatched roof, the restaurant has no walls, allowing the wind to billow gently through as diners relax and feast on a variety of fresh and tasty cuisine showcasting the best of Bali. Traditional artwork combines with rattan furniture and teakwood tables created by local craftsmen provide a comfortable dining environment, where the dress code is casual. Situated in the tranquil, coastal environment of northeast Bali, this intimate spa resort provides the perfect holistic retreat. The peaceful atmosphere, warm sunshine, fresh air and soothing sounds of the ocean lend an ideal environment to de-stress and recharge. At Spa Village Resort Tembok, Bali, we introduce you to a holistic approach to wellness that focuses on overall health and happiness.